Ask your students to explain what the words "hypotenuse", öpposite", and ädjacent" refer to in a right triangle. Unfortunately, many students do not grasp the significance of this triangle, but rather memorize it as a "trick" used to calculate one of the three variables given the other two. Explain why a right triangle is an appropriate form to relate these variables, and what each side of the triangle actually represents. This question asks students to identify those variables in each circuit that vectorially add, discriminating them from those variables which do not add. This is extremely important for students to be able to do if they are to successfully apply "the triangle" to the solution of AC circuit problems. 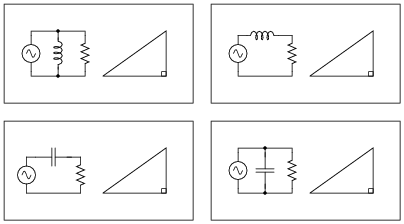 Note that some of these triangles should be drawn upside-down instead of all the same as they are shown in the question, if we are to properly represent the vertical (imaginary) phasor for capacitive impedance and for inductor admittance. However, the point here is simply to get students to recognize what quantities add and what do not. Attention to the direction (up or down) of the triangle's opposite side can come later. X = 105 W, as calculated by an algebraically manipulated version of the Pythagorean Theorem. Calculate the total current and the angle Q of the total current, explaining your trigonometric method(s) of solution. Q = 60.26o (negative, if you wish to represent the angle according to the standard coordinate system for phasors). Follow-up question: in calculating Q, it is recommended to use the arctangent function instead of either the arcsine or arc-cosine functions. The reason for doing this is accuracy: less possibility of compounded error, due to either rounding and/or calculator-related (keystroke) errors. Explain why the use of the arctangent function to calculate Q incurs less chance of error than either of the other two arcfunctions. A parallel RC circuit has 10 mS of susceptance (B). 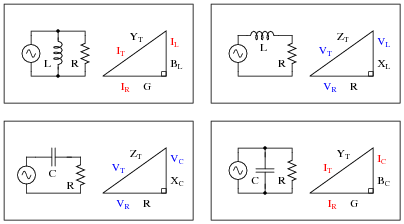 How much conductance (G) is necessary to give the circuit a (total) phase angle of 22 degrees? I'll let you research this one on your own! The Pythagorean Theorem is easy enough for students to find on their own that you should not need to show them. A memorable illustration of this theorem are the side lengths of a so-called 3-4-5 triangle. Don't be surprised if this is the example many students choose to give. Z = 625 W, as calculated by the Pythagorean Theorem. The only way we can algebraically isolate the angle Q in this equation is if we have some way to ündo" the cosine function. Once we know what function will ündo" cosine, we can apply it to both sides of the equation and have Q by itself on the left-hand side. There is a class of trigonometric functions known as inverse or ärc" functions which will do just that: ündo" a regular trigonometric function so as to leave the angle by itself. Explain how we could apply an ärc-function" to the equation shown above to isolate Q.
. . . applying the ärc-cosine" function to both sides . . . Since all side lengths on this triangle are known, there is no need to apply the Pythagorean Theorem. However, we may still calculate the two non-perpendicular angles in this triangle using ïnverse" trigonometric functions, which are sometimes called arcfunctions. Show how three different trigonometric arcfunctions may be used to calculate the same angle Q. Challenge question: identify three more arcfunctions which could be used to calculate the same angle Q. Some hand calculators identify arc-trig functions by the letter Ä" prepending each trigonometric abbreviation (e.g. ÄSIN" or ÄTAN"). Other hand calculators use the inverse function notation of a -1 exponent, which is not actually an exponent at all (e.g. sin-1 or tan-1). Be sure to discuss function notation on your students' calculators, so they know what to invoke when solving problems such as this. What these students might not ordinarily discover is that this triangle is also useful for calculating electrical quantities other than impedance. The purpose of this question is to get you to discover some of the triangle's other uses. While this is perfectly correct, it is an interesting exercise to have students convert the equation from this (simple) form to that given in the answer. It is also a very practical question, as equations given in reference books do not always follow the most direct form, but rather are often written in such a way as to look more esthetically pleasing. The simple and direct form of the equation shown here (in the Notes section) looks ügly" due to the fraction inside the radicand. This question is a straight-forward test of students' ability to identify and apply the 3-4-5 ratio to a right triangle. R = 4.979 kW, as calculated by an algebraically manipulated version of the Pythagorean Theorem. X = 214.2 W, as calculated by an algebraically manipulated version of the Pythagorean Theorem.